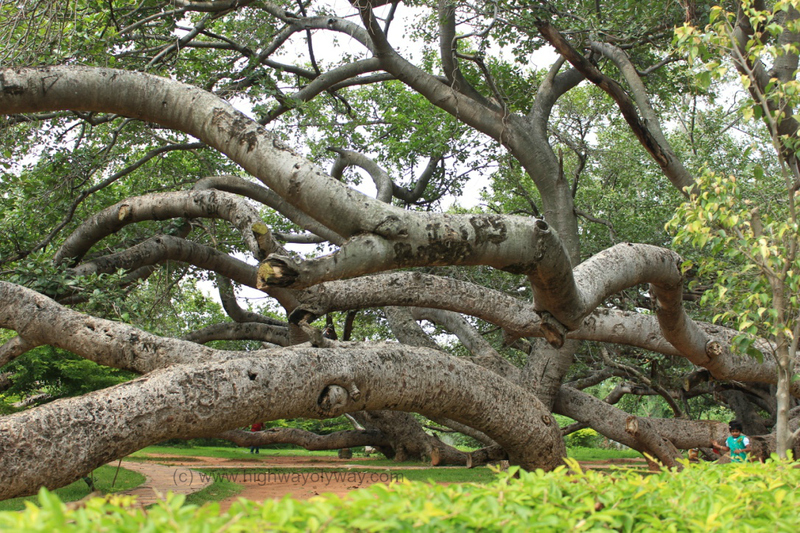 Pillalamarri Banyan Tree – 700 years and counting ! Of all the traditions we follow, travelling on our wedding anniversary is something we adhere to very strictly, the wedding date itself was chosen because it preceded a National Holiday and every year we could get two days to travel and sometimes add a weekend and make it a 4 day holiday ! 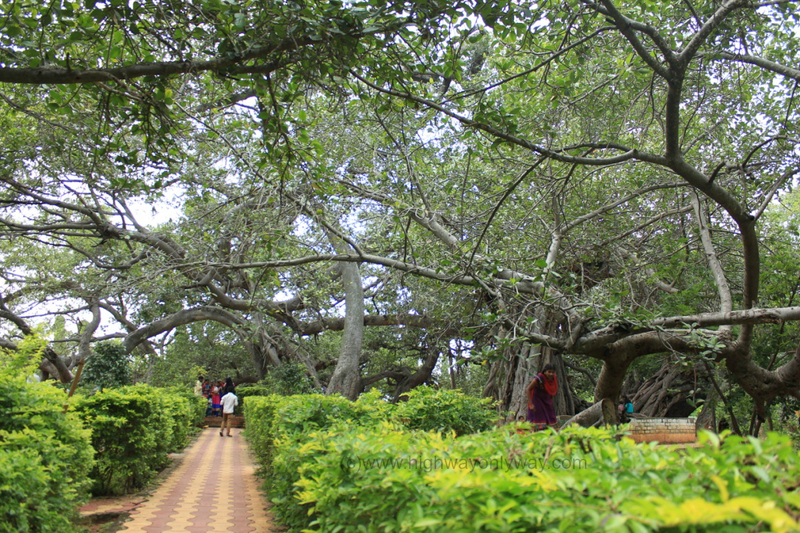 This year, work played havoc with our plans but we decided the tradition had to be followed and if we couldn’t travel far, we’d make a short trip to the nearest possible place and so we zeroed in on Pillalamarri Banyan Tree, one of the oldest Banyan trees in the world, located some 90 kms from Hyderabad. 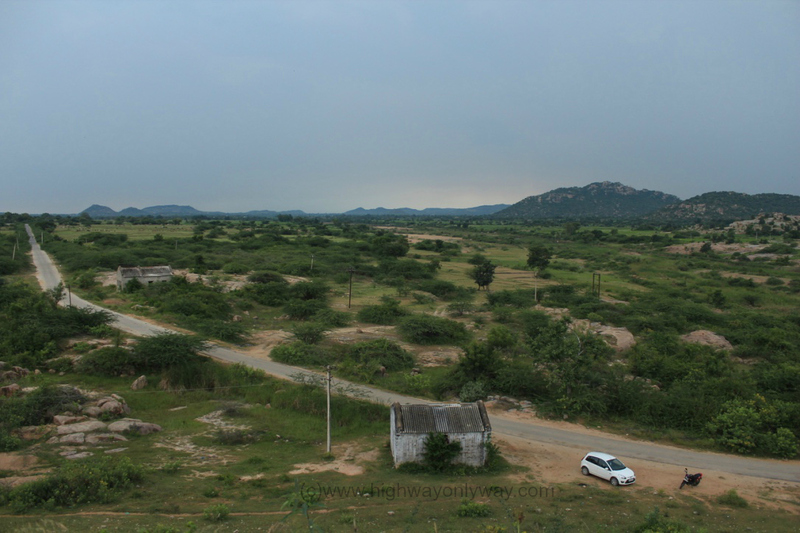 Pillalamarri (not to be confused with Pillalamarri temple of Nalgonda) is located just off Mahbubnagar on the regular NH44 route to Bangalore, since it was not going to be a very long drive and we had all the time in the world, we decided to explore the less travelled Parigi route. The idea came up because we wanted to have Dosas at our regular Dosa cart at the Himayath Nagar junction just before Chevella road. If you ever travel on the Chilkur or Chevella road via Himayath Sagar, look for the Dosa cart at the crossroads exactly where the road splits, one road to Chilkur and the other to Chevella, there is a Canara Bank ATM for landmark. It is a simple roadside cart that operates from 6 AM to about 11 AM, their spicy, masala dosas are lip smacking ! After our late breakfast at 10.30 AM, we continued on the Parigi road, admiring the pleasant country side. The route was different from the high flying NH44 as we passed by cotton fields and vegetable farms, we were definitely taking a round about route but worth the fun of driving through a different route. After about an hour, we were back on NH44 near Shadnagar, you cannot escape this highway if you want to go to Mahbubnagar unless you drive through some unknown village roads. Continuing our experiment, we tried to deviate into a village to avoid the Jadcherla toll plaza, hoping we could connect back to highway after crossing the toll. The authorities, though, were far more intelligent and the village road reconnecting to the highway was blocked !! We drove back to the highway and paid the toll there is no escaping the highway toll ! We made a quick stop at Hill Park Hotel after Shadnagar on the highway. This drive in food joint always looked interesting from the highway, mainly because of their innovative logo, an old fashioned car model. 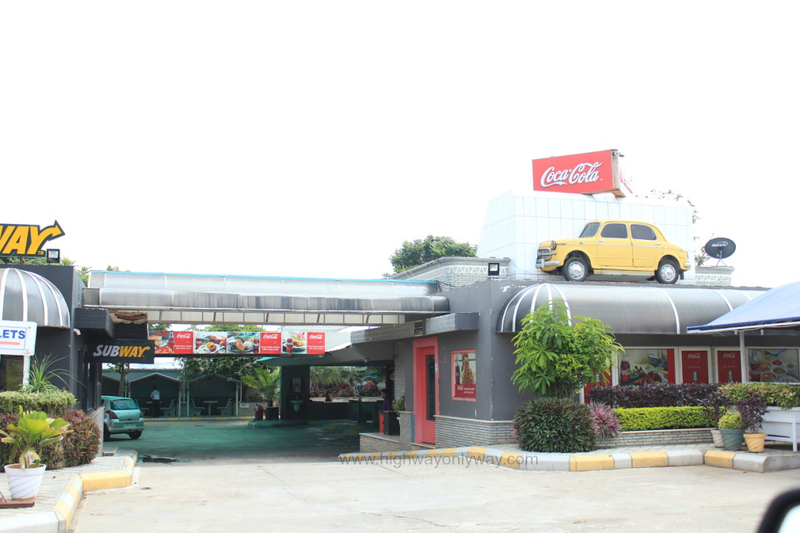 The Drive in restaurant is designed like a bus station with platforms to park your car and seats right next to it. A nice place for a break though if you are driving from Hyderabad, you wouldn’t need a break at that point. We had a cup of tea and some soft drinks and proceeded towards Mahbubnagar. 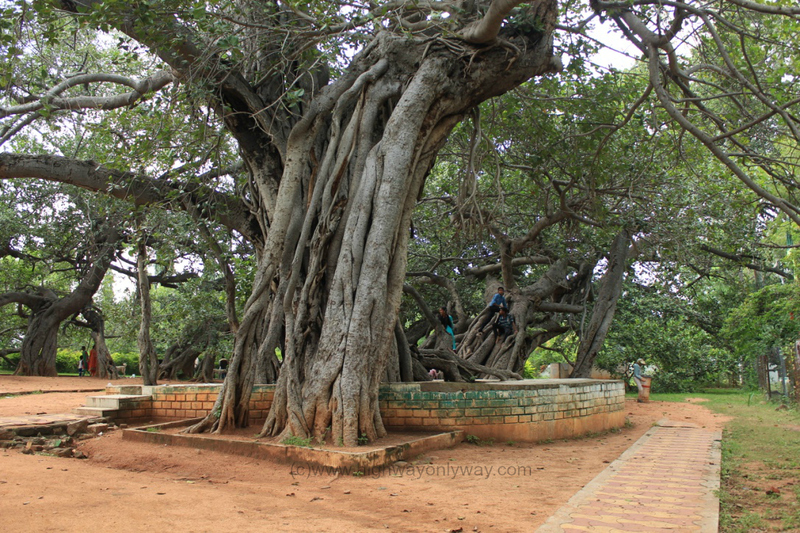 The Pillalamarri Banyan Tree is 700 years old and is 5 kms from Mahbubnagar city. We arrived at the park housing the tree after a short drive through the city and our first thought was that we were looking at the Home Tree of Avatar movie ! 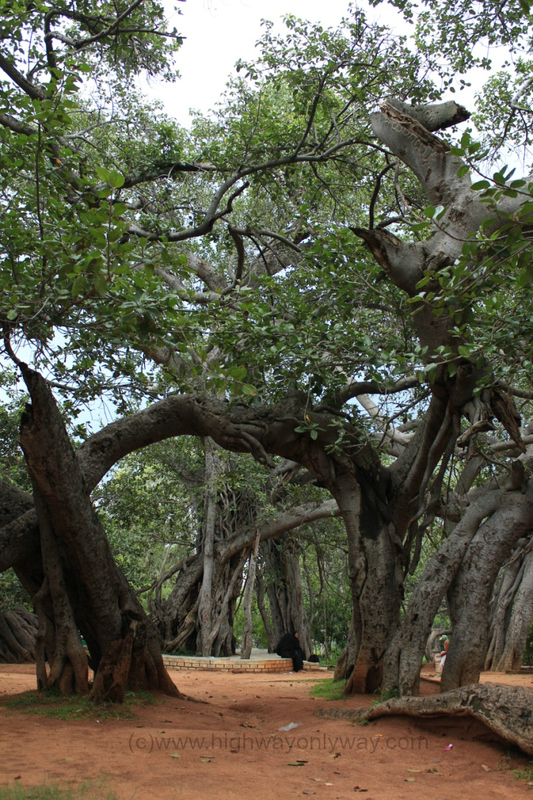 The Pillalamarri Banyan tree has stood at the place for over 7 centuries and has spread it’s branches across 3 acres, one set of roots reaching the ground and another tree growing from it and then another and then another until it became one big green and brown maze and the maze is still growing ! The branches of the tree have spread everywhere around the place and have look like giant tentacles of some massive pre-historic animal ! 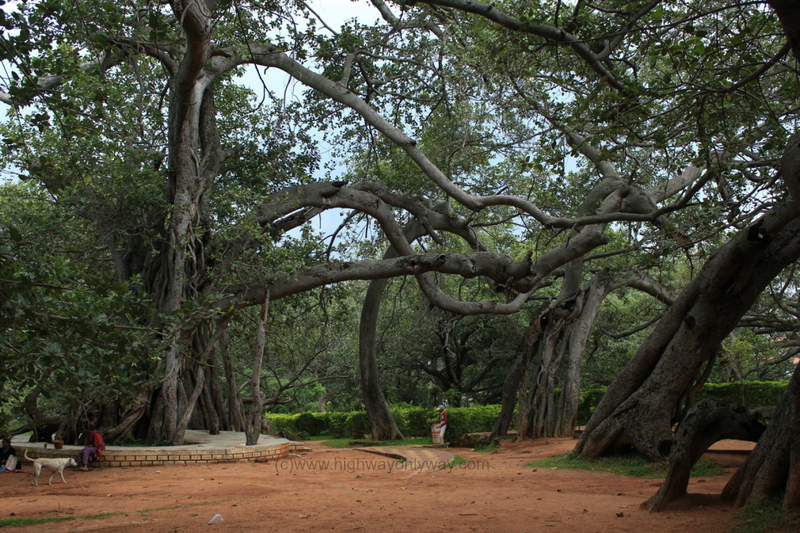 Some have gone one to take different shapes, like this one, A for Alamaram (Banyan tree in Tamil) ! Here is a natural arch ! You cannot trace the mother tree, this one does look like the starting point but then every other branch could be the base too, that is how complicated the network of the Pillalamarri tree has grown in all directions. 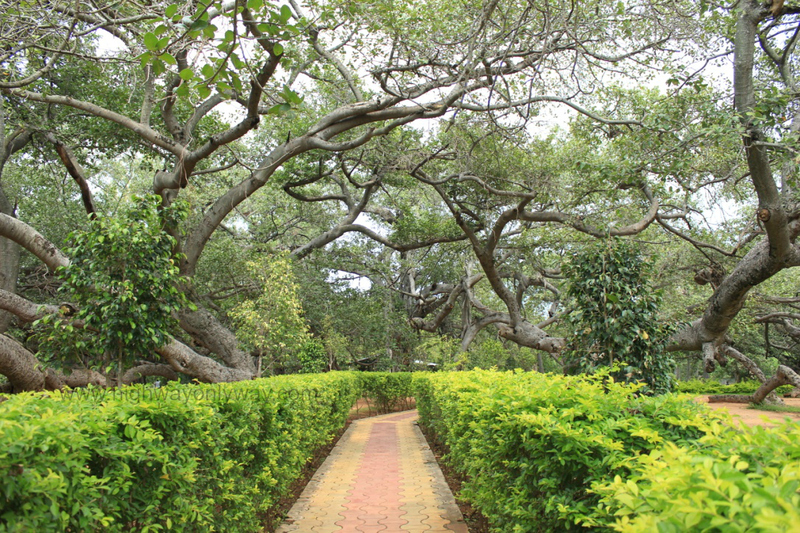 We had initially thought we wouldn’t spend more than 20 minutes at the Banyan Tree and wondered if it made sense to drive 90 kms for that but it turned out that we spent close to one hour simply gazing at the tree and trying to solve the maze ! While we were busy tracing the roots, dark clouds gathered overhead and we could hear rumblings and thunder, the special effect with the ancient, spooky looking Banyan tree in the background was just perfect ! We caught the sounds in a video but we’re only sharing a picture and we leave you to imagine the light and sound effect. It looked like it would rain heavily and we thought it would be wonderful to stand under the tree and watch the rain but except for the loud thunder, there was no rain. After one more round around the tree and clicking more pictures, we left the park towards the Pillalamarri Mini Zoo. 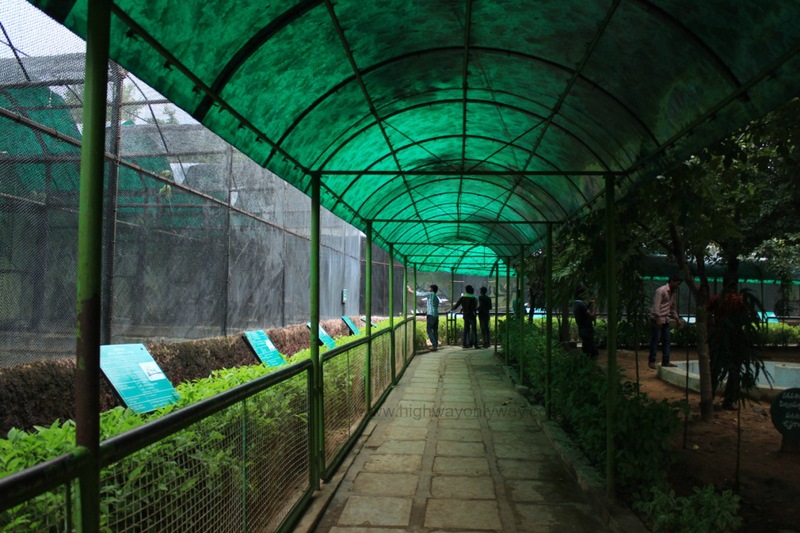 The mini zoo has a few enclosures with birds, snakes and other reptiles and a small play area for kids. The place is well maintained too. 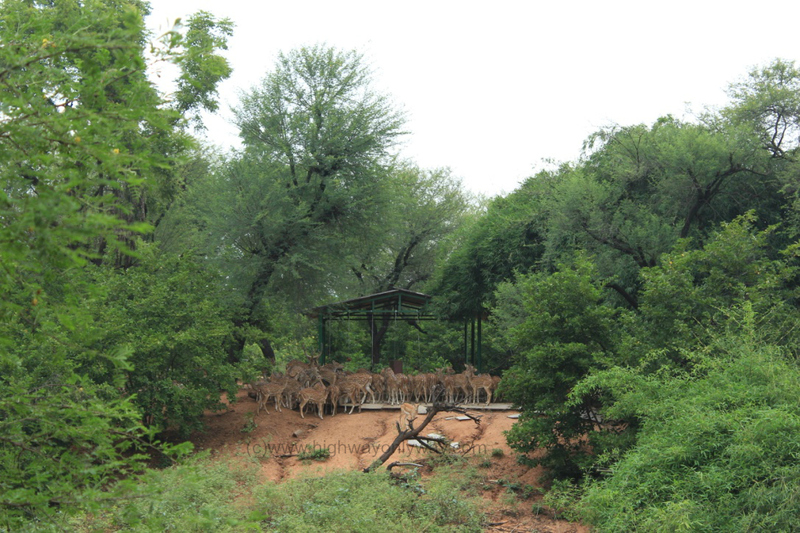 Adjacent to the mini zoo, there is also a deer park. While we were there, it looked like a Deer Conference was on ! We couldn’t get a better picture from the fencing with our small lens. There is also a small museum at Pillalamarri housing ancient Hindu and Buddhist sculptural treasures discovered in the nearby region. There is one life size statue of a Bodhisattva in a seated position, though the head is missing, the size of the statue simply grabs your attention. 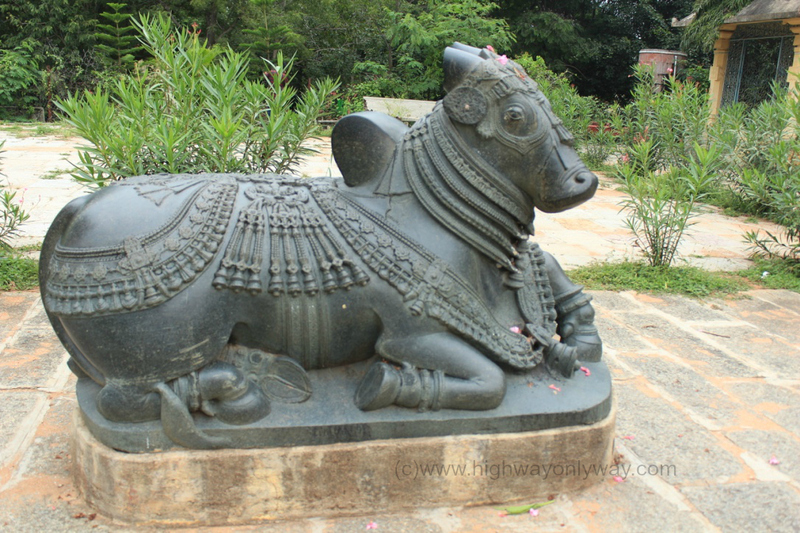 We did not click pictures inside the museum but found this beautifully sculpted Nandi near the zoo. Some people thought it was a nice prop for a picture and hopped on to the Nandi for a click. One felt like walking up to the young boys and giving them a tight slap for disrespecting the ancient heritage but all we could do was give them a nasty stare. If we can’t teach our people to appreciate our history can we atleast teach them to leave it alone and not make a joke out of it? 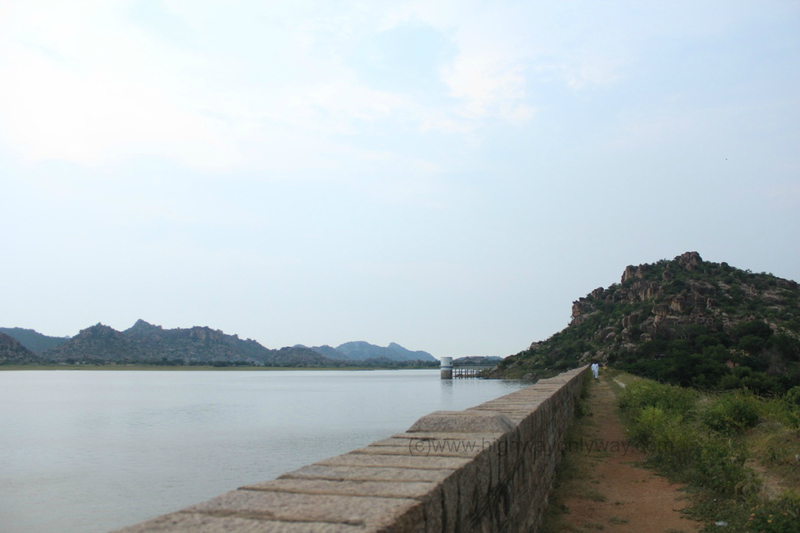 After a short walk around the museum, we left Pillalamarri and headed towards Koil Sagar Dam, 36 kms away. The place was a little detour from our route but we wanted to drive there, just for the fun of it. It was a fun ride along the country side. 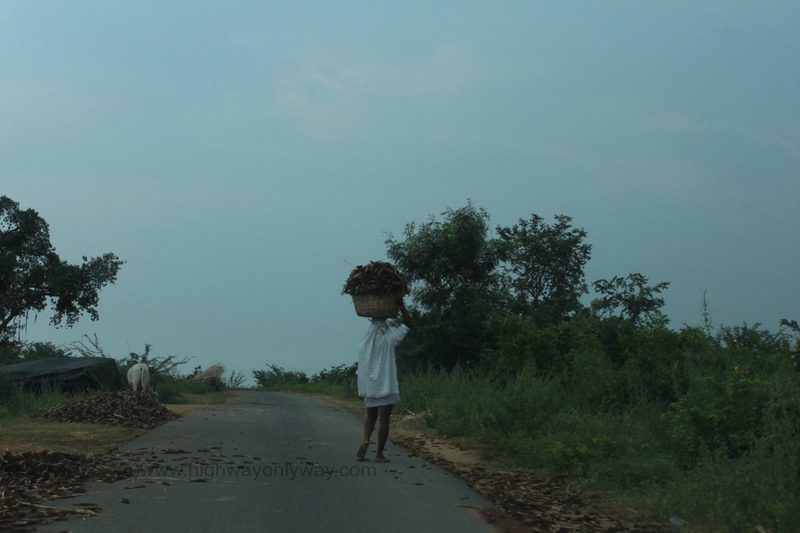 It must have been the harvest season for millets, farmers had spread the harvest on the road so vehicles passing by would crush the grass and do the threshing job, an age old practice in rural India, not a safe practice but it seems to be working for them over the years. We drove to some interior parts of the region until we reached the village of Koil Sagar and spotted the reservoir, driving further we arrived at the Dam. 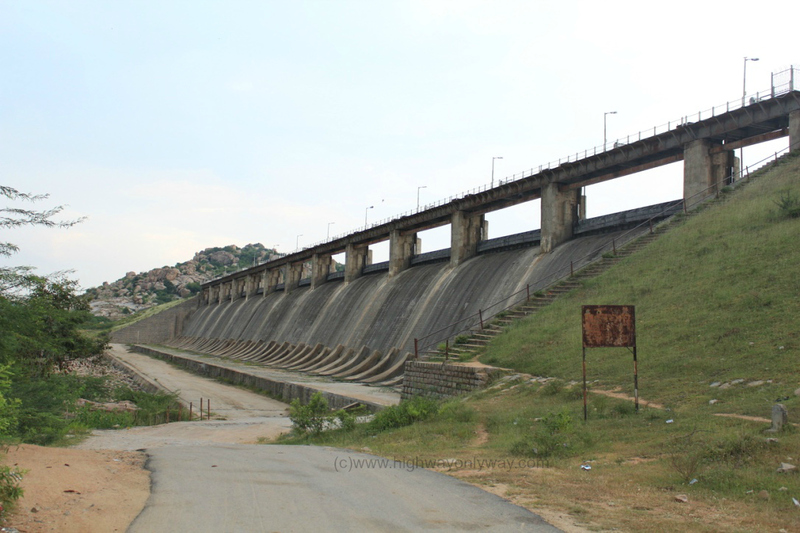 The Koil Sagar Dam is built over the Pedda Vagu River, a tributary of the River Krishna. The dam runs very close to the road and there are steps leading to the top from where you can view the reservoir. Must be quite a sight to stand by steps and watch the water gushing out when the gates are open. You can take a walk on the dam for a pleasant view of the reservoir. and an equally charming on one the other side ! There are steps leading down all the way to the reservoir, we found some people having a splash but we did not venture near the reservoir. We spent a few quiet and peaceful moments atop the dam in the cool breeze, climbed back and set our wheels homeward. Evening had sent it as we passed by the same millet fields, it was wind up time for everyone. On our way back, we took the regular NH7 from Mahbubnagar all the way to Hyderabad, stopping for an early dinner at Jadcherla. It was a short day trip in total leisure but somehow we felt like we had been away on a long holiday, such complete recharge of the mind batteries ! Pillalamarri is a nice place for a short leisure from Hyderabad, ideal for a Saturday or Sunday trip when you wake up in the morning and want to go on a long drive. Good roads throughout. Have lunch at Jadcherla, drive to Pillalamarri and head back on NH44. Kids would enjoy the place as would the childlike. You can even combine it with a visit to Jurala Project, 85 kms from Pillalamarri, especially during the rainy season when the Jurala gates are open. 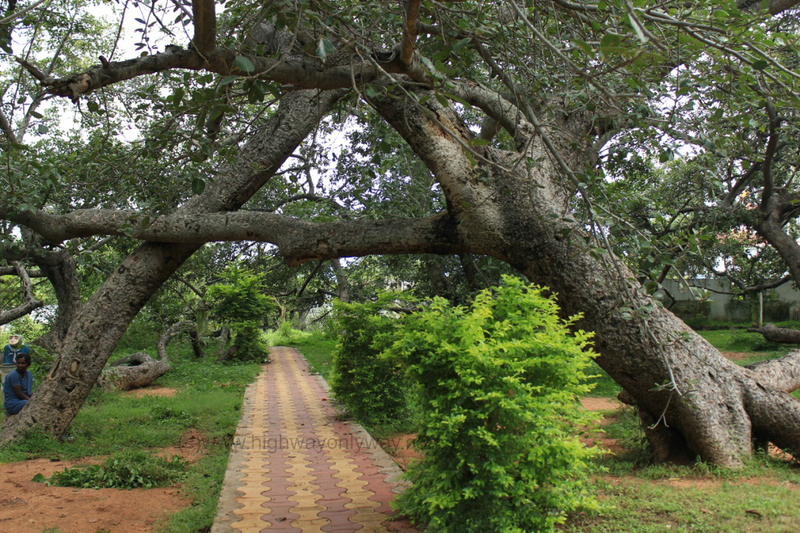 Since the place is only 5-6 kms from Mahbubnagar, food options are not an issue. You can drive to Koil Sagar dam if you have time to spare, would like to get a feel of rural Telangana and simply want to strike off the place on your list of places visited. 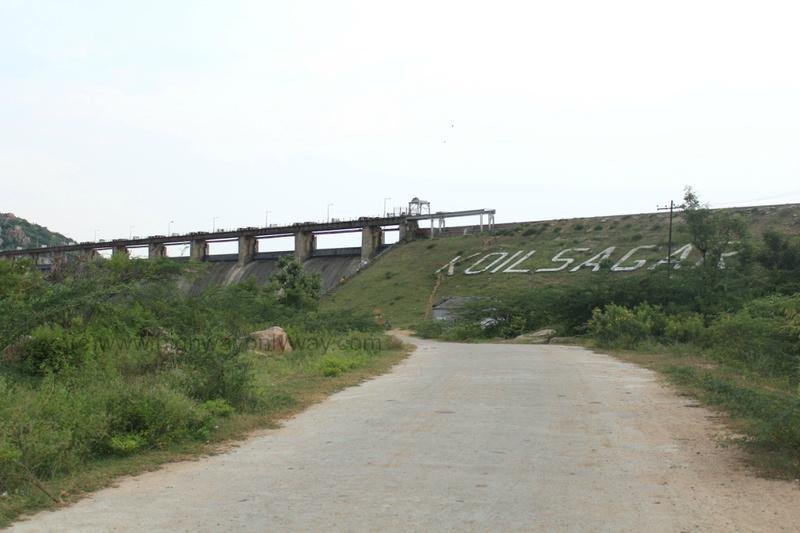 Otherwise Koil Sagar Dam is not a very popular tourist spot.